DETROIT (Cobo Center)—There are over 2.3 million prisoners in the American criminal justice system according to a 2016 report from Prisonpolicy.org. There are presently 1,719 state prisons, 102 federal prisons, 942 juvenile correctional facilities, 3,283 local jails and 79 Indian Country jails in addition to military prisons, immigration detention facilities and civil commitment centers in the U.S.
From these staggering numbers Blacks make up 37 percent of the inmates even though Blacks are only 14 percent of the U.S. population. These are very alarming statistics and were a major topic of discussion in one of the many workshops during the Nation of Islam’s annual convention in Detroit, Mich. to celebrate the 140th birth anniversary of its founder Master Fard Muhammad. In the Prison Reform Ministry workshop, student Minister Abdullah Muhammad and East Coast prison ministry representative Brother James Muhammad hosted a panel of formerly incarcerated presenters to speak in the one and a half hour session, Feb. 18. About 100 participants came to hear testimonies of those whom were once incarcerated and are now, doctors, speakers and professionals. “The teachings took me from where I was in the streets and a life of crime, to now go back to my people. ... I have my Doctorate degree now and have taken the Study Guides given to us from the Honorable Minister Farrakhan and use them like the 12 step program,” said Sister Dr. Arisah Muhammad, former Western Region Student M.G.T. Captain. Sister Dr. Arisah spoke very passionate words of encouragement to women with such gratitude for being able to become an example for women who are within and now out of the penal system. “I was privileged to survive the prison system and being able to be successful through the teachings of the Most Honorable Elijah Muhammad and the Honorable Minister Farrakhan. The one thing I’ll like to say to sisters who are queens: Don’t give up on yourselves, no matter what it looks like, no matter what it feels like, no matter what they say that you’re not going to be,” she continued. “They plan and Allah plans too and Allah is the Best of planners, stay focused!” she stressed. Participants in the workshop were in tears as presenters spoke about their horrific experiences while being in prison and their struggle to get out. Brother Gregory Muhammad spoke about his experience. “I fought to stay alive in there. It was times they would put me in the hole for months because I refused to bow and I wasn’t going to. We were discipline and they knew it. Nothing was going to break us. But All Praises are due to Allah for coming to us and blessings us with His exalted Christ and His divine reminder in the Minister that we made it brother,” said Brother Gregory Muhammad who now serves in the Delaware Valley Prison Ministry of the Nation of Islam. “We survived prison by applying the Restrictive Laws and Rules of Conduct of the Nation of Islam. Not with muscles, threats and cracking faces or being tough … that’s not what we do,” he said. Abdullah Muhammad, National Prison Reform Student Minister, got choked up with tears when speaking about Min. Farrakhan and the Hon. Elijah Muhammad saving him. 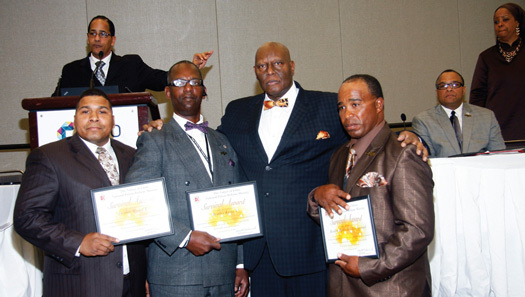 “This Prison Ministry is helping the Honorable Elijah Muhammad and his witness and anointed servant Minister Farrakhan Muhammad to fulfill prophecy,” he said. “I see my job is to go in on behalf of the Honorable Elijah Muhammad’s supreme witness to nourish the brothers in such a way that they see Minister Farrakhan as the one that Allah is well pleased that is opening blinded eyes, bringing prisoners out of prison and those who are in darkness out of prison houses. And I’m blessed to be one of the vessels that he’s using to do that work,” said Student Min. Abdullah. “Those are our family in there, don’t leave them in there, they don’t deserve to be in there,” he added. The purpose for the workshop is to present to our people a torchlight, that if we follow the divine guidance given to us by Min. Farrakhan and pulling our resources, mentally and economically that we can help our brothers and sisters who are incarcerated to survive and come out reformed, explained Bro. James Muhammad, of Rochester, N.Y. and who moderated the workshop. There were a lot of testimonies from panelists who have demonstrated through practicing the teachings of the Hon. Elijah Muhammad how they can be reformed then come out and become productive members of society, he added. “Most of the members on the panel got degrees after being incarcerated and are successful today,” said Bro. James.